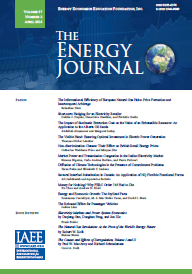 This paper focuses on the impact of oil, natural gas and coal price shocks on the Spanish business cycle from 1969 to 2013. It uses Bayesian procedures to estimate a Dynamic Stochastic General Equilibrium (DSGE) model for a small open economy. The paper shows that natural gas and coal shocks are relevant sources of macroeconomic disruption in addition to oil price shocks. The three fossil fuel prices have an impact on the economic activity and explain the evolution of the energy mix. However, we find that oil price shocks have a significantly larger impact on economic volatility. Finally, we assess the impact of hydrocarbon price shocks on carbon emissions given that different price shocks result in a different fossil fuel mix and, thus, in different CO2 emissions. Proceedings - Sustainable growth with renewable and fossil fuels energy sources: a DSGE approach.